A zombie mall, an orphaned elephant — as demolition looms, time is running out for the Burlington Center Mall's final resident to find a new home. A 30-year-old elephant sculpture named Petal sits lonely inside a vacant, soon-to-be demolished mall in Burlington County, New Jersey. The artist who created Petal , also the sculptor of the Frank Rizzo statue in Philadelphia, hopes a new home can be found for his first-ever artwork. Inside the leaky, desolate confines of the building recently named New Jersey's saddest mall, only one tenant remains. And not just any tenant. Petal, a life-size elephant made completely out of fiberglass, served as a memorable fixture of the Burlington Center Mall for the past 30 years. Now, she’s facing eviction from the only place she has called home. But it’s clear that Petal holds a special place in his heart. "The elephant was my first big piece,” he said. "I did it when I was still a student. ... It’s like my firstborn." Petal, a statue at the vacant Burlington Center Mall in New Jersey, is desperately searching for a new home. The elephant fountain was originally commissioned by Stockton Strawbridge, the scion of the Strawbridge and Clothier retail empire. Strawbridge had just returned from Africa and wanted children to be as thrilled by the elephants as he was. Petal measures 11 feet high and 8 feet wide, 12 feet from front to back, and carries a full-size child on her back. Her informal name, Petal, comes from her real-life model at the Philadelphia Zoo. Petal made her debut at the Burlington Center Mall in the summer of 1982. When the mall opened, it was anchored by Sears, Strawbridge’s (now Macy’s), and JCPenney’s among its 100 stores and restaurants. But 30 years later, it began to struggle. In 2007, an incident of gang violence leading to temporary mall closures left some residents uncertain about its safety, NJ.com reported. In 2017, an Advance Media ranking of New Jersey’s malls called Burlington Center "rundown and deserted", placing it dead last. And finally, in January 2018, frozen pipes burst, damaging the fire alarm system and leading to officials’ decision to close the mall earlier than its previously scheduled shutdown in March, the South Jersey Courier Post reported. Google reviewers call Burlington Mall a “ghost town” and an “asphalt wasteland,” although it isn’t the only one struggling to compete with the convenience of online shopping and the lure of to-door delivery. The American mall itself is dying; according to a 2017 report published in Fortune, 1 out of every 4 malls is projected to close by 2022. The plan is to demolish the shopping center. 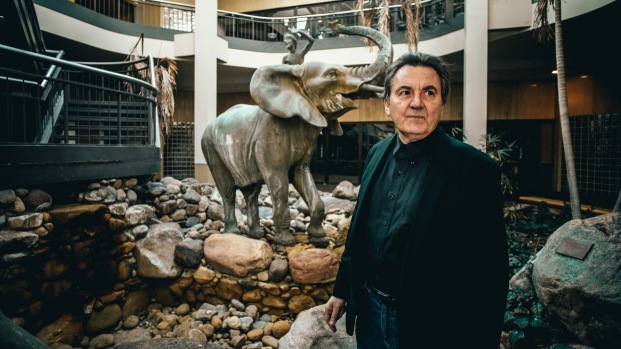 But even though the mall can’t be saved, Frudakis insists the elephant can be. Sculptor Zenos Frudakis, with his first-ever artwork, Petal, at the now-vacant Burlington Center Mall, Dec. 13, 2018. The mall's owners, Moonbeam Capital Investments, are willing to donate the sculpture to any organization for free, providing that they're willing to move it, according to the studio. The artist hopes somewhere like a non-profit organization, a zoo or a hospital can continue to enjoy Petal. But while several parties have expressed interest in adopting the parentless pachyderm, none have committed to take her. That might be because of the cost of the fountain’s removal and installation, which Frudakis hopes to cover with a GoFundMe page. Petal has multiple fans, the studio said, who call her every week hoping to hear about the fate of their friend. “Some of them came as children to see the sculpture, and have children of their own now,” Frudakis added. For now, Petal’s still waiting in the now-defunct Burlington Center Mall. She’ll be there, Xuereb says, until she can be moved, either to a temporary or a permanent new home.